Oh man, the winter is still in full force, so when a friend of mine gave me this recipe, I had to pass it along. 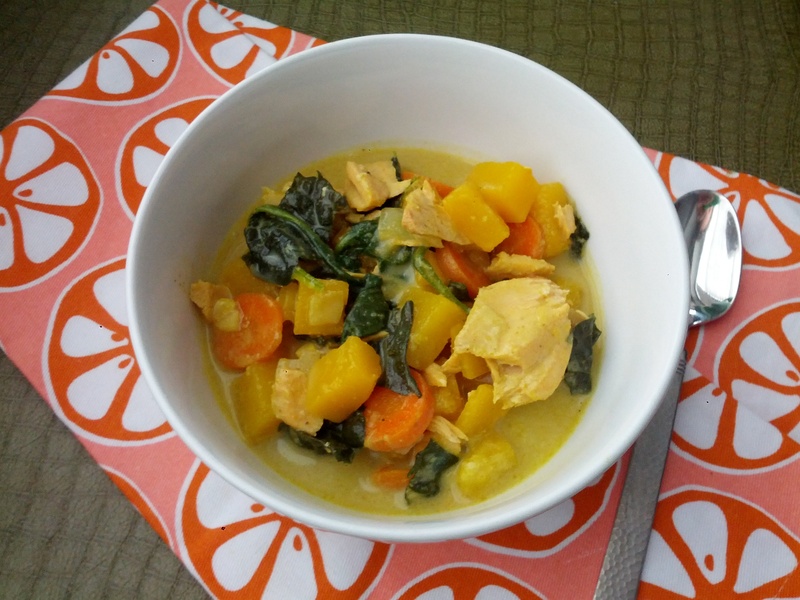 I admit that I’ve been shy of curry powder but want to branch out since trying this soup…it is quite a tasty spice. Sophia (my selective eater) has been chowing down on my Kale and Sweet Potato Soup for the past several months, so I wanted to make something that included lots of healthy veggies for the girls. When I initially made this, it was too spicy for them, so I think I will leave the curry out completely or just use a little next time. You can also get creative and add some protein to make it a one pot meal. My friend added shredded chicken and I added two filets of salmon, cooking until they broke apart. I have to say, it was delicious! Try it out and let me know what you think. Be sure to share what’s been simmering on your stove during these winter months. 2. Add onion, ginger and garlic, cooking until onion is soft. 3. Add squash & carrots, cooking for 5 minutes. 4. Add coconut milk, broth, curry and sea salt, and bring to a boil while constantly stirring. 5. Reduce heat and simmer for 10 minutes. Add in kale & stir for 5 minutes. Optional: add in chopped chicken, ground meat or 2 salmon fillets (cooked until they break apart easily). Hello young Lady 🙂 How are you doing. Hope you had a great week. Wondering if you had a chance to send me a list of the farmers market.